Yesterday I splurged $1.17 at Go Daddy to register the domain www.ch4notgore.com for a year. Dozens of my blogs have dealt with natural gas being the best alternate for power generation in combined cycle stations and that compressed natural gas and liquefied natural gas make real sense as a transportation fuel. CH4 is methane and methane constitutes approximately 98% of natural gas. CH4notGore will probably go mass market using a T Shirt with the above photo printed on it. I intend to sell the T Shirt at the next annual meeting of the American Petroleum Institute to thank them for the fine work they did in bringing us shale natural gas despite Gore's attempts to stop this real green fuel. 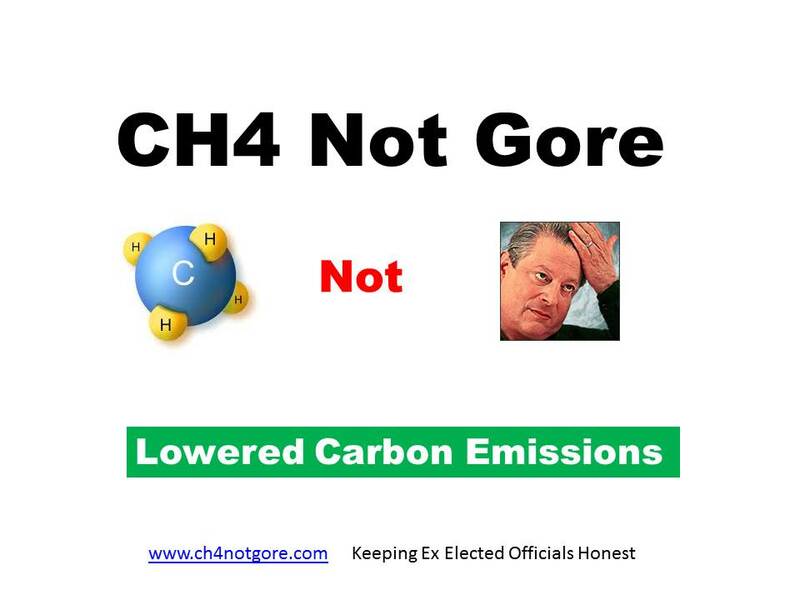 Anderson Cooper has the motto "Keeping Them Honest", CH4notGore has the motto "Keeping Ex Elected Officials Honest". I am sure that with Al, Col, Condi and numerous other opportunists on the Green Bandwagon I will have to print several T Shirts. The Green Machine is not the only one extolling the virtues of natural gas. The article was written by Joel Kurtzman Executive Director, Center for Accelerating Energy Solutions, Milken Institute. The Milken Institute holds a global conference each year that is a meeting of the who is who in world movers and shakers. I agree with the conclusions of Kurtzmans article “that It is ironic that the a country that declined to ratify the Kyoto protocols is now poised to exceed the standard in levels and perhaps timing.” Note the grammar error is from a direct quote in the article. Unfortunately for those who wish to use data from the article, the article has a couple of factual errors. The factual errors do not diminish the role of Natural Gas in lowering carbon emissions and Mr. Kurtzman’s thesis that natural gas has been good for the air, good for the economy, and especially good for consumers is absolutely spot on. The article states “In 2008, CO2 emissions were about 1,600 million metric tons a year, according to the EIA. Today, they are 1,300 metric tons, a drop of nearly 20 percent.” US CO2 emissions in 2008 were 5,802 million metric tons and are expected by the EIA to be approximately 5,300 million tons for 2012 which is a drop of 8.7%. The article states "In 2008, about half of America's electricity was produced by burning coal, with 20 percent produced from natural gas, according to the EIA. Today, 40 percent of our electricity comes from natural gas with coal's share just 32 percent." The 2008 data are correct but in 2012 37.5% of electricity in the USA is estimated by the EIA to be generated from coal and 30.4% from natural gas. See the chart from the EIA below. The article correctly pointed out that by having access to low cost natural gas the US has effectively lowered its yearly carbon emissions and that our country does not need expensive carbon but should continue to focus on producing shale natural gas for two purposes namely more jobs through economic growth and lower carbon emissions through the wonder of natural gas as a fuel. Happy Holidays and keep the force of hydrocarbons behind you. I have to challenge you on this one, Lindsay. I'm not too keen on (wo)man poking more holes in our space ship ,so we can continue on this trajectory of 'comfortable in cocoons of consumerism comfort' --especially because of information revealed that the EPA has done a less than honorable job to ensure the public health interest is not compromised by hydraulic fracking. The EPA should at the very least compile field information to see if this does represent a risk to ground water. I'm just saying, natural gas demand needs to decrease, not increase--it will continue to be a part of the energy mix for some time, I am sure. I think there was a typo in the title--it should have read, "Wind Power Installations Beating Natural Gas in the U.S. in 2012"
The installations of wind are larger for the year but the yearly output is far smaller as the wind turbines are only available for 20% of the hours in the year and the natural gas turbines are available for 90% of the year. The real question on shale gas will be who will be the first operator to mess up and how badly will they mess up. The operations can be performed safely if the operator pay attention to safety and the environment. 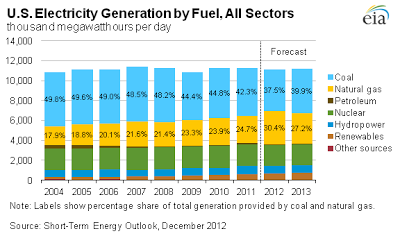 In fact wind turbines require back up natural gas turbines so wind on its own adds very little. Inexpensive natural gas also makes for less expensive transportation fuel. Of course my first preference is that people drive less, heat their houses less, but LED lights and use less power, but natural gas is our wonder Fuel and Al Gore is our wonder Fool. I take it you won't be buying a T Shirt?